Chad and Kelly were happily married on June 16th. 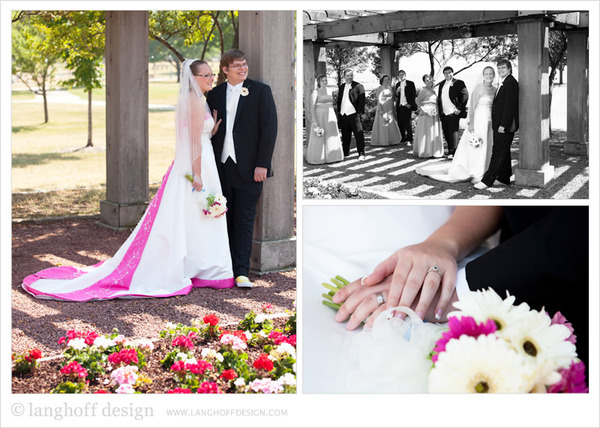 We were absolutely honored to shoot their wedding in Kenosha and hang out with them all day in celebration with their fantastic family and friends. Initially, the rain gave everyone a bit of a scare, but it turned out to be a bright, beautiful afternoon next to Lake Michigan. Boy, was it HOT! The occasion was filled with laughter, custom Converse kicks, and plenty of love. I hope you enjoy the highlights! We heard rain on your wedding day was good luck. Great news—these two had a downpour before the ceremony! Here, Kelly's father and mother helped get her ready to be presented to her Groom. Meanwhile, the Groom was making some preparations of his own. Looking quite dapper! As the guests arrived at Wolfenbuettel Park for the ceremony, the excitement in the air was building. Kelly was a lucky lady—she was escorted down the aisle by both her father and step father. So special! The newest Mr. & Mrs.! Chad & Kelly's wedding party was so much fun. What a tight-knit family! Sandra Arneson from Flowers With Love arranged the gorgeous flowers for their wedding. This was certainly a fun group of ladies! Their deep friendship was so obvious. Chad and the groomsmen were rockstars. Let the celebration begin! Their reception was held at the UW Parkside Union. The ringing of little bells could be heard all evening as invitations for the Bride & Groom to kiss. Sharing is caring, right? Chad and Kelly enjoyed sharing their cake—ALL over each other's faces. These two have so much fun together! Chad and his mother, Kelly and her father, and the Bride and Groom shared memorable dances together. Look out ladies....the most handsome man in the room caught the garder! Robin's Nest Cakery made the cake and cupcakes—complete with Mickey mouse ears on the little Precious Moments cake topper. Chad and Kelly were looking forward to their Disney honeymoon! I loved the very creative guestbook they had at the wedding and reception. People were invited to add their thumbprint and add whatever creative touches they wanted with their message. There was certainly no shortage of dancing, either. Especially with Kelly's younger brother owning the dancefloor! This was one of the happiest family celebrations we have ever attended. We are truly excited for Chad and Kelly and wish them the best for their long future ahead! To see all of the photos from Chad & Kelly's wedding, sign their virtual guestbook here to view the entire gallery.